Orange Sorbet brings many memories to mind. Sitting on the porch on a warm summer's day with iced tea and a Orange Cream Popsicle. When I opened this scrumptious smelling jar of 365 Days of Color Hand Cream review those memories came flooding to the surface. This hand cream smells amazing. The fragrance is not overpowering yet is identical to the Orange Sorbet I remember. I handed the jar to my husband to smell and it was all I could do to keep him from licking it. 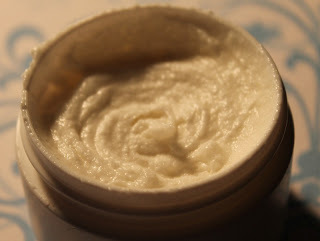 When I tried hand cream I realized how it applied like silk. It's whipped and light. . You may find it a slight bit greasy if you use too much. It only takes a small dab of it to moisturize your hands - and it quickly soaks in to your skin and leaves your hands silky smooth. I am going to keep using this as it is great for my abused hands. Wyoming's cold and dry weather is hard on my skin. Finding something that works and smells so amazing is hard. So this is going to be a staple of my hand care regimen. The ingredients are: Shea Butter, Coconut Oil, Jojoba Oil, Vitamin E Oil, Tapioca Powder, Grapefruit Seed Oil, and Fragrance Oil. 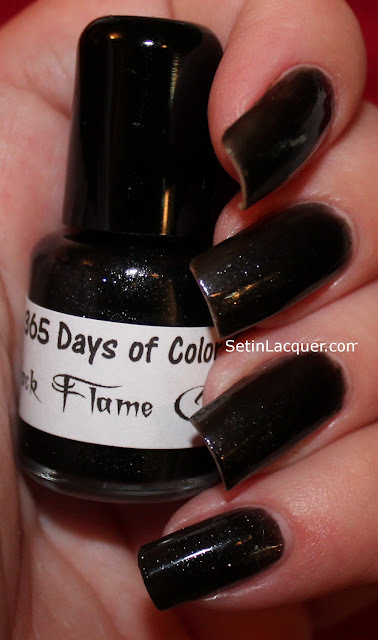 365 Days of Color makes hand creams, cuticle oil and nail polish. The hand creams are $5 for a 2 oz jar or $8 for a 4 oz jar. The hand cream comes in a ton of different scents such as: pumpkin vanilla, orange grove, cream cheese frosting, jasmine and more. I'm definitely going to be picking up a few more scents! You can find the complete line of hand creams and other products on her website at www.365daysofcolorpolishes.com. You should also follow her on her Facebook page to keep up with new scents and polishes. This product was sent to me for review and all opinions are my own. I am excited to share this Indie polish line with you. 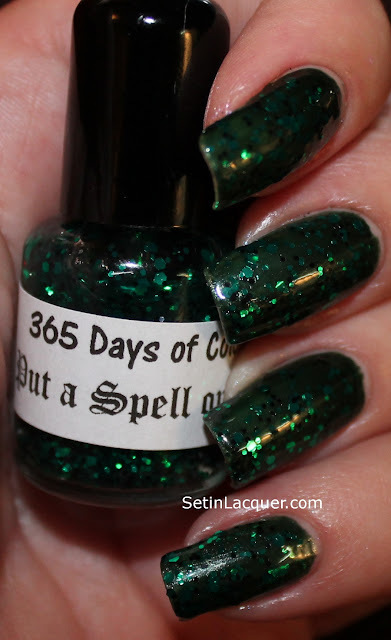 Hocus Pocus is a spook-tacular collection of glitter that is sure to thrill and delight all the glitter lovers out there. This line will be released on or about the 28th of September by a proven Indie polish maker - 365 Days of Color. The collection has a little bit of something for everyone. The formula is great. The glitter applied evenly and I didn't have to go bobbin' for glitter. The dry time was great too. Some took a few coats but that is dependent how much glitter you actually like on your Halloween adorned nails. Let's move on to the swatches! 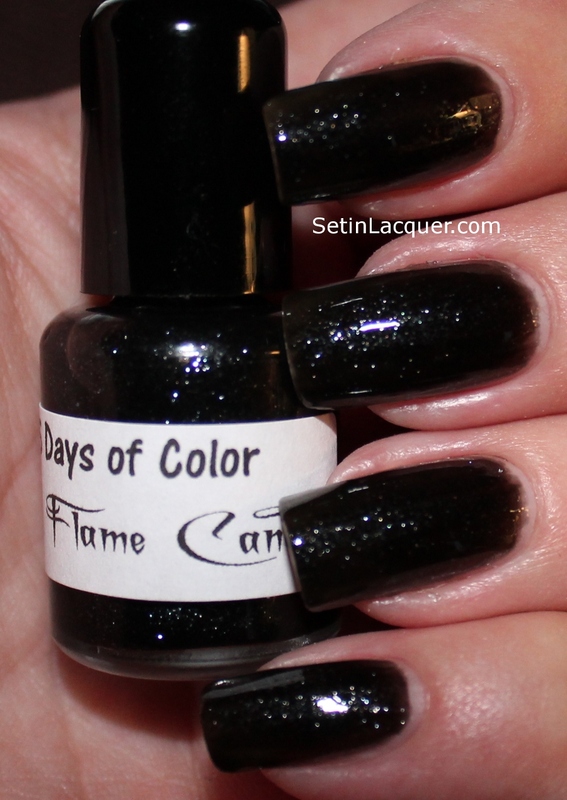 Black Flame Candle is a jet black base with micro glitter. The silver glitter shimmers and shines with a magical glow of subtle color. This is three light coats. Boouk is a ghostly flesh base color with gold, bronze and brown glitters. This is three coats without a base color. Lots of super glitter in this one. I then used Boouk with a base color of Sabrina Sato Ballet - This is one coat of Boouk. 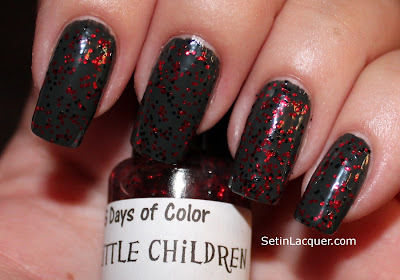 Come Little Children is a fetching top coat with black and red glitter. This is one coat over Zoya Noot. My favorite of the bunch is I Smell... Children. A gorgeous black base with tons of fantastic purple glitter. Lots of bewitching color in this one! 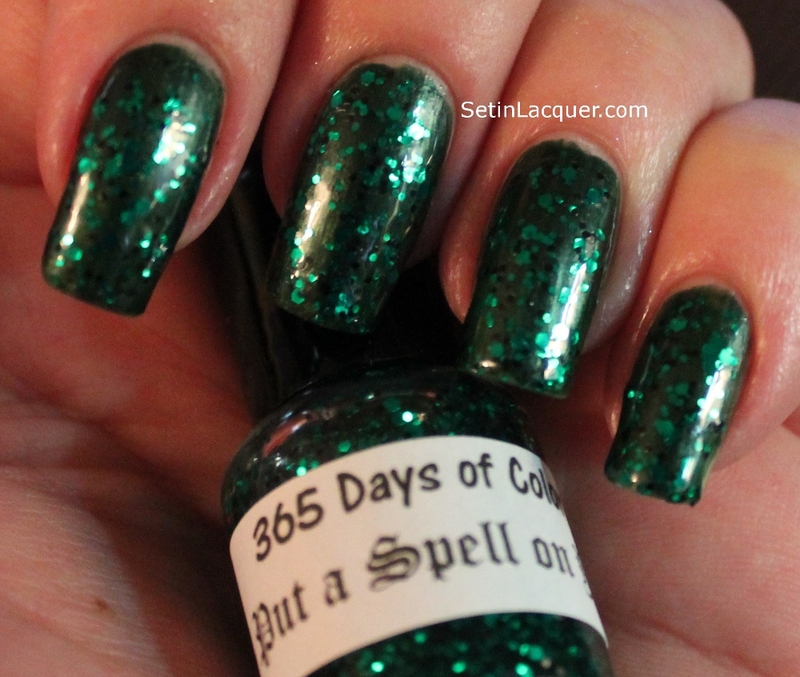 I Put a Spell on You is a spell binding green glitter top coat. The swatch below is over Zoya Ray. The Hocus Pocus Collection will be available on 365 Days of Color Big Cartel website at http://www.365daysofcolorpolishes.bigcartel.com/ on or about September 28.